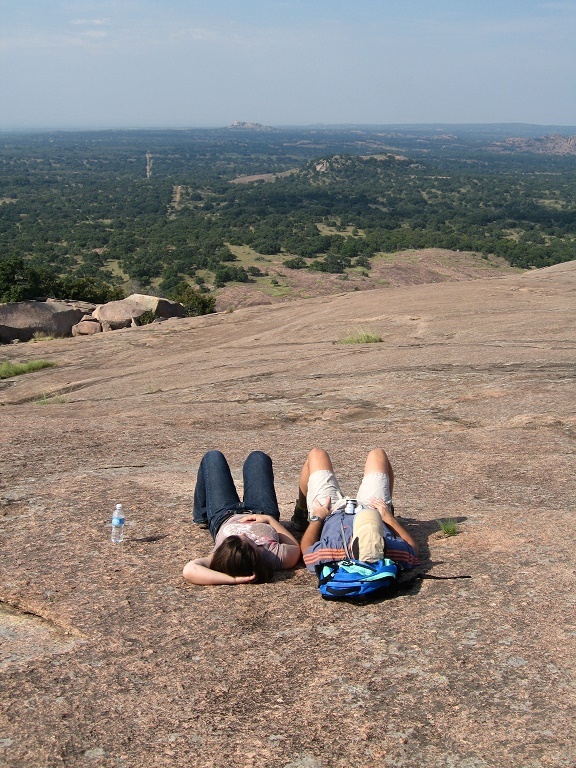 Visitors to Enchanted Rock SP, relaxing because they “saved the Day”. Ditch the “will I or won’t I get in” guessing game that often comes with visiting Texas’ most popular state parks. Now parkgoers can “Save the Day”. Thomas Wilhelm is the marketing and branding manager for Texas State parks. [Thomas] So, what we’re calling “save the day” is essentially paying your entrance fees in advance. And by doing so, you’re guaranteeing access to a park. We have some parks that are super popular in that they fill up and we have to turn people away because of the limitation of the number of people allowed in a park. So with the Save the Day pass, you essentially pick a time slot that you are going to arrive at the park, pre-pay your entrance, and you’re guaranteed access to the park. So, you don’t have to worry about showing up and being turned away because the park is full. [Cecilia] Well, you know, you might get there, but you might be behind a line of cars. Will there be another entrance for these people who have their pass? [Thomas] We’ll have to work through those. Depending on the site, we may be able to create dual entrance lines. There will be a learning curve for both our employees and our customers. But, I think, in the long term, it will really speed up the process. Not just for guaranteed access, but also for getting you into the park faster and onto the fun. Make your reservations on the Texas Parks and Wildlife website. Tomorrow: Buying and managing your Texas State Park Pass online. For Texas Parks and Wildlife…I’m Cecilia Nasti. Overnight visits to Texas State parks are easier than ever to plan, thanks to improvements in the online reservation system, including picking your own site. We’ve been listening to our customers for a long time. And some of the things that we’ve heard that are most wanted by our customers is site specific reservations. Thomas Wilhelm is the marketing and branding manager for Texas State Parks. Before this new online reservation system, overnight campers could reserve a type of site, but not a specific site. Pick your site is a huge boon for the system. When people show up at a park, they want to know that they’re getting into a campsite that will work for them. So, whether its because they have a larger RV, or they want to guarantee that they’re near their friends and family, they want to know which site they’re going to be in before they get there. There’s nothing worse than showing up at a park, having your reservation, and realizing the only sites left available to you are ones that don’t really work for your equipment. With the new system, they’ll have the ability to go online, look at pictures and descriptions of every single campsite in the system, and then pick the campsite that works for them. And then they know exactly where they’re going when they get to the park. Make your reservations online on the Texas Parks and Wildlife website. Tomorrow: The Save the Day Pass. I know it feels like summer just started, but school will be back in session before you know it. 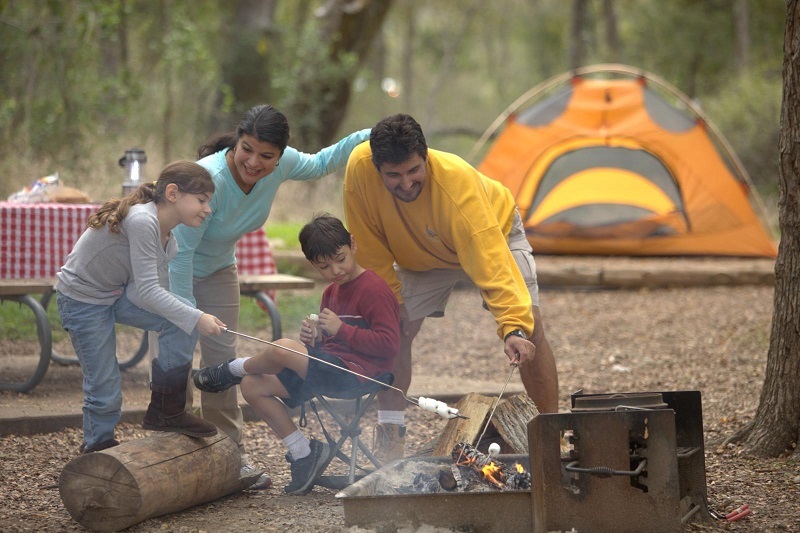 Before the school bell rings for the fall semester, maybe it’s time to gather the family for a camping getaway. With parks in every region of Texas, your destination is only a short drive away. Most state parks have campgrounds, and some of those have water and electric hook-ups. 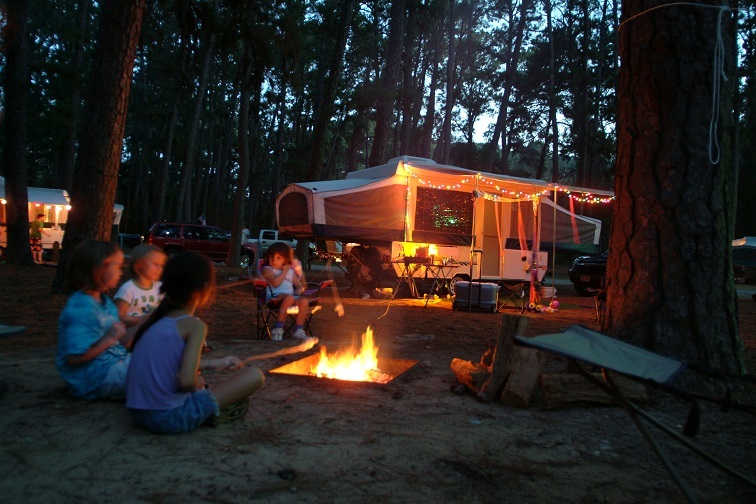 Several parks also accommodate RVs for those who wish to bring a little piece of home with them to the great outdoors. Before you travel, check to see what RV connections are available at your campsite. For the pampered camper, check out state parks that offer cabins and lodges. Historic landmarks and secluded ranches make for a relaxing getaway. When camping, remember to properly dispose of food waste to discourage unwanted animals visitors; and always pack out what you pack in. Remember that you are you are not just a visitor, you are part of the natural world, and as such, it is your responsibility to keep it healthy and inviting to others. 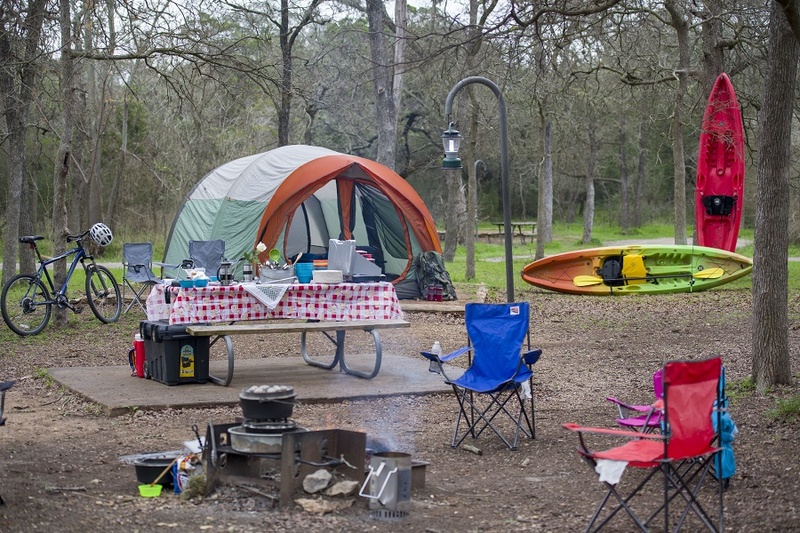 If you’ve never been camping before, consider attending a Texas Outdoor Family workshop where For Texas Parks and Wildlife staff teaches you and your family the basics in a fun-filled weekend. Find more outdoor opportunities at the website lifesbetteroutside.org. Prepared camping, is fun camping. Do you avoid overnight camping because you’re afraid you won’t get your beauty rest? The folks that do avoid camping tend to think that it’s not comfortable. Well, it doesn’t have to be that way. If you’re concerned you’ll be counting sheep instead of sawing logs on your overnight campout, Robert Owen with the Texas Outdoor Family Program says a blanket and pillow and a few other items will have you sleeping like a baby in Mother Nature’s embrace. I always like to bring either a foam pad to sleep on or an air mattress – and even cots are getting especially popular now. Sleeping bags often have a temperature rating on them, so you’ll want to make sure that you know what your overnight lows are going to be; maybe even subtract a couple of degrees from that just to be safe, and make sure your sleeping bag is rated for that temperature. We have some tips for folks who are going to spend the night outdoors when the temperature starts to drop: air mattresses –they can actually cool you off over night. They might be very comfortable, but it’s like sleeping on a pillow of cold air. If you can insulate yourself against that pillow of cold air, it’s really going to make you more comfortable overnight. All that means is laying a blanket or sleeping bag below you – between you and the air mattress – and that goes a long way. 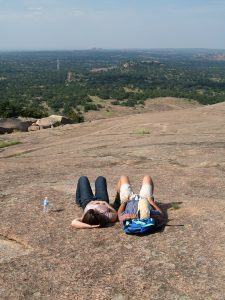 Reserve your site at your favorite state park at texasstateparks.org. Fall camping season is here, and Robert Owen—an avid camper who oversees the Texas Outdoor Family program—offers suggestions for choosing a campsite for your overnight adventure. What I look for in a campsite is a bit of privacy. I enjoy a quiet end of the park; a place where the family can settle down and enjoy peace and quiet of nature. Nearby nature trails – looking for a trail that offers the family something to do right off the back of the campsite is always a real benefit. Also, I always like to reasonably close to water if the park offers water so that all those recreational opportunities are there. I also look for a campsite that has level ground. There’re no safety concerns like low hanging limbs or anything like that, that might interfere with my evening. And proximity to the restroom. You always want to make sure you’re within a comfortable distance of the restroom. One of the best ways to ensure that close proximity to the restroom is to reserve your campsite in advance. Tomorrow sawing logs instead of counting sheep when sleeping under the stars. That’s tomorrow. You are currently browsing the archives for the Camping category.